Apologies for the radio silence recently, I have been super busy with work and have been finding things a bit overwhelming so blogging has had to take a back seat. Luckily, our families had something planned to get me out of the house and despite me being super tired, it was super fun! You know how much I love going on little day trips (yes I am already an OAP!) 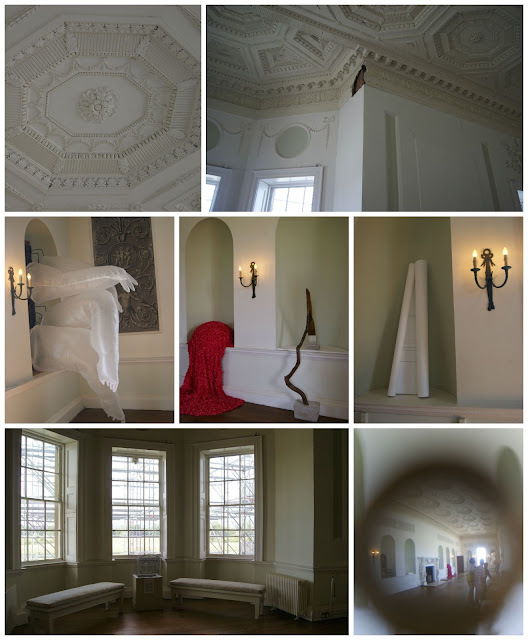 and Croome Court was ideal as it is just up the road from us. It is one of the closest National Trust properties to us and we used to visit a lot when we were kids but it has been a while (last time we went, my 4 siblings and I managed to fit into a hollow tree trunk, that's how log ago it was!) so I was interested to see how much had changed since then. Croome was a little different though as it is currently undergoing significant restoration at the moment. 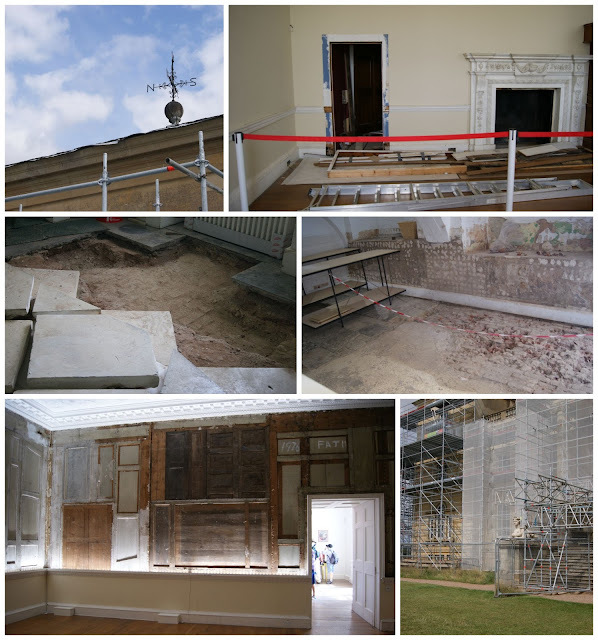 I mean you can see it in these pictures, there were flagstones pulled up, walls exposed and scaffolding covered the outside of the house. I mean, isn't this cool?! I'm not sure when these tiles date from but they look super 1970s to me! There were originally some beautiful French tapestries in this room but they were sold off when the estate ran into difficulties. The dominant colour was this gorgeous raspberry pink- I bet they made an amazing feature wall! 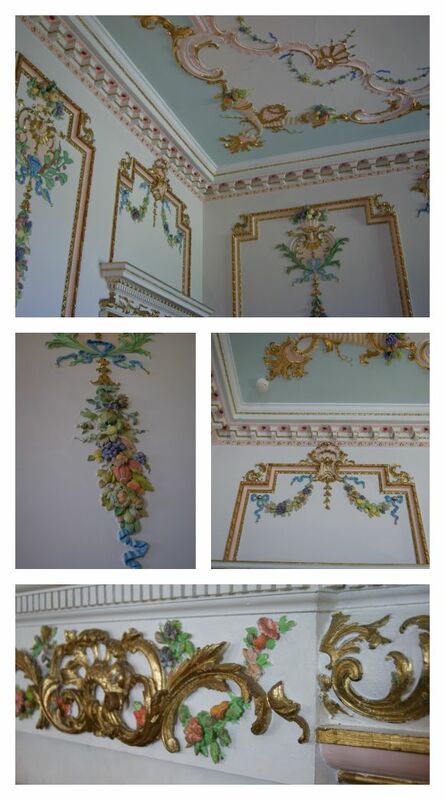 The dining room is amazing, the fruit plasterwork dates back to the eighteenth century but the house was used by Hare Krishnas between 1979 and 1984 and they painted it all in these vibrant colours. It's a bit of a controversial topic but I love how colourful it is, even if others aren't so sure! As you saw, there is scaffolding enveloping the entire house at the moment and there's a cafe 12 metres up there at the moment. We didn't buy any food or drink but the views were worth the climb, even if I was too scared to go anywhere near the edge. Luckily Mark took this video for me so you can get an idea of how amazing the views were! Apparently the house and parkland were Capability’ Brown’s first commission and he transformed it from marshland into this beautiful estate. This beautiful bridge is a replica of the Chinese bridge which stood on the same site in the eighteenth century but was lost to decay. Luckily a £200,000 Sainsbury Trust grant meant that the National Trust were able to reconstruct the crossing and this opened properly earlier this year. I asked Mark to take a picture of me and I didn't realise that this woman was looking at me so scathingly, her face is priceless! There was a kite flying event on and although we had limited success, it was very very fun! A look back up the hill towards St Mary Magdalene's Church, Croome D'Abitot. OMG that woman's face! I love the bridge. The photos remind me a lot of Attingham, which is our local NT property. I need to make time to visit some more NT places before the end of the year! She's staring right ah you! Looks fab! I love National Trust places - we're off to Bodiam Castle for a day trip tomorrow! Really like your playsuit too. This looks so lovely! Love the new blog layout too! We love Croome! Our favourite thing is to walk across the grass to the Park Seat and have a picnic there.